Note: track 3 translates to "Love Dust". Group BIG BANG revealed more of the track list for their new album. Management YG entertainment additionally released the titles of tracks 3&4 through YG-life. The third track is 'Love Dust', a song composed and written by both member G-Dragon and producer Teddy. 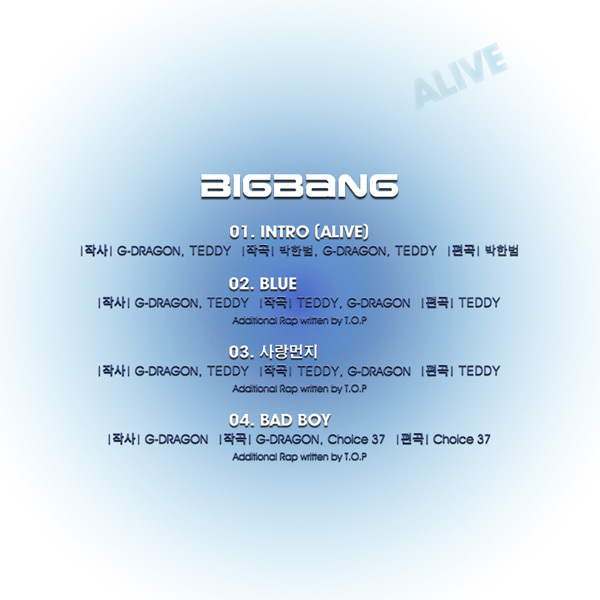 The fourth track is 'BAD BOY', a product of G-Dragon and Choice37's team work. The two track list revealed on the 26th brought the attention of fans, which had been also composed and written by G-Dragon. YG stated "It is difficult to give a detailed answer about BIG BANG's comeback album", and also said "We plan to update the track list every day, so please watch out for us. We will also reveal a surprising news as well." Big Bang has teamed up with their endorsement brand, ‘Gmarket‘, to collaborate on the release of a new set of cellphone cases! Starting March 26th, Gmarket will be exclusively selling limited editions of Big Bang phone cases featuring various pictures of the members. 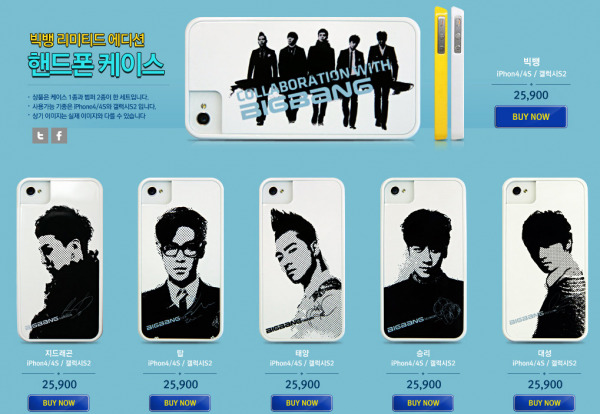 The limited edition set is for the iPhone 4, 4S, Galaxy S2, and cost 25,900 KRW (~23USD). 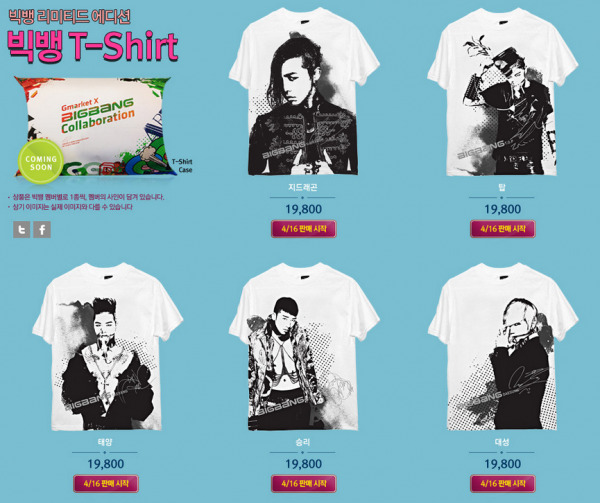 They are also selling, Big Bang limited edition T-shirts for 19,800 KRW (~17USD). Fans can select which individual member picture they would specifically like to purchase for both items. 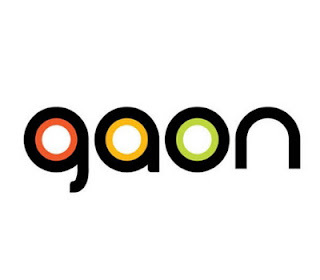 International fans are also in luck as Gmarket offers overseas shipping for these items. 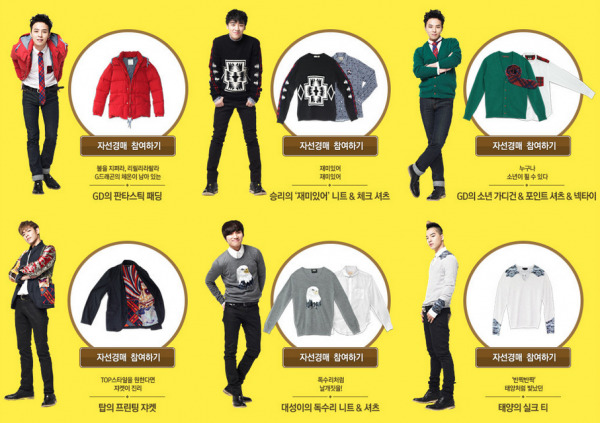 Lastly, a charity project is underway titled the ‘Big Bang Style Donation Project‘, where clothing items worn by the members during their endorsement shoot will be auctioned off to raise funds for children battling incurable diseases. It goes without saying that fierce competition exists on the Korean music charts. There is a new song seizing the #1 spot with each day, and different charts rank the same songs differently. But of the many competitors, there are two names that continue to maintain their status on the charts, and they are none other than idol group Big Bang, and legendary singer Lee Seung Chul. Even an entire month after releasing new albums, these two artists still rank high on the charts, and this sort of outcome was almost expected by fans and music professionals alike. Lee Seung Chul managed to stay popular on the charts for 40 days after releasing his new ‘Feast of the Gods‘ OST, “Did You Forget“, on the 17th of last month. And as of March 27th at 6:00PM KST, “Did You Forget” ranked #5 on charts such as Melon, Mnet, and more. When it comes to the call-back ringtone download charts, he is way ahead of most of the popular idol groups out there today, and the Youtube video for the track has already passed the 750,000 hit-mark. An insider from his agency remarked, “His deep, appealing vocals pair well with the emotions of the drama series and is garnering much attention.” MBC’s ‘Feast of the Gods’ is currently drawing in an impressive 17.2% of total viewer ratings, and Lee Seung Chul has been coined the ‘OST god’ after his OSTs for “East of Eden“, “Baker King Kim Tak Goo“, and more became hit classics. In addition to Lee Seung Chul, leading idol group Big Bang quickly achieved an all-kill after releasing their single “Blue” on February 17th, and their song “Fantastic Baby” from new mini-album ‘ALIVE‘ is not only #1 on Melon, it also ranks within the top 10 on Olleh Music, Monkey3, Mnet, Soribada, and Bugs. Other tracks such as “Blue”, “Bad Boy“, and “Love Dust” also continue to maintain their high ranks. Some of the biggest names in K-Pop such as legendary idol group Shinhwa, 2AM, SHINee, CNBLUE, Jang Nara, Busker Busker, and more have all released their new albums around the same time, but the fact that Big Bang’s album has not been threatened by these big players, and maintains its elite status on the charts, is extremely noteworthy. Kim Gu Ra revealed a story of humiliation which attracted laughter. His son appeared in 'Star Junior Show' of SBS and said,'because I appeared in the programme,when I went back for the new school year, people would ask me for the signatures of the celebrities or even their contacts. 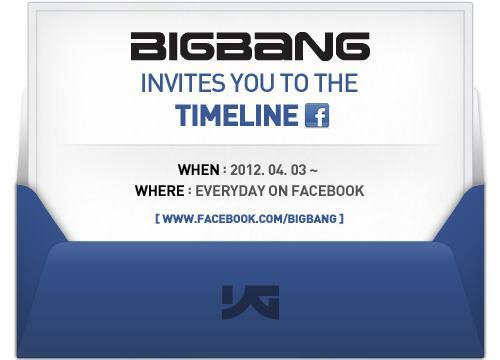 People will also ask,'What is Big Bang doing? what do the members of SNSD like? Is it correct that somebody is dating somebody?'etc. Kim Gura said,' kids nowadays are so irrelevant.' Since he once went to his son's school but faced humiliation. 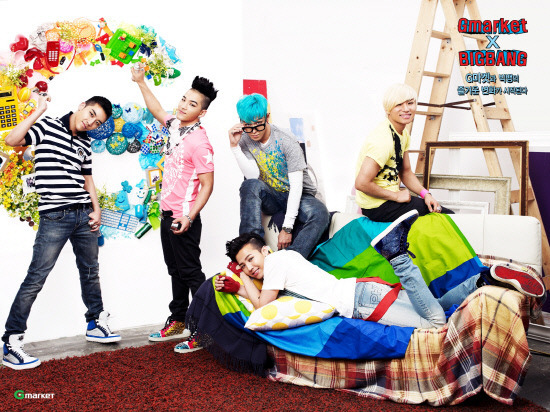 He continued,'When I went there,the girls asked me,"adjussi,you have seen Big Bang before? 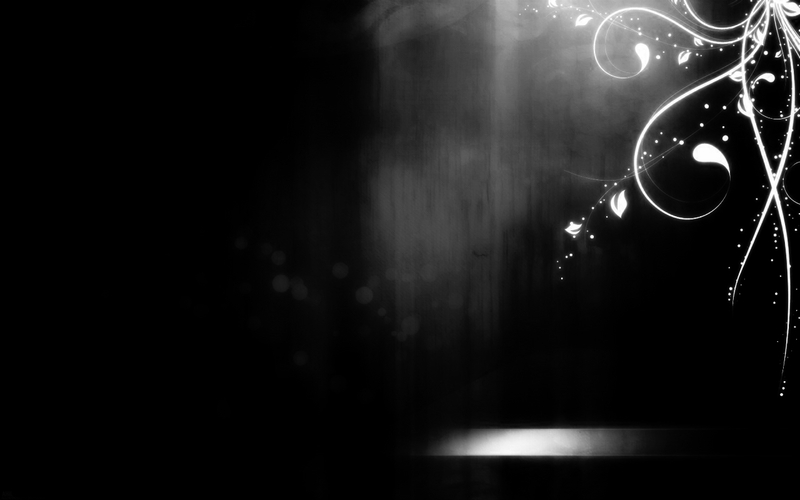 "and I answered, "no, I have not" they then said,"you saw them in 'Intimate Note'. "Then they all went away. His story of being neglected has attracted laughter. The programme will be broadcasted at 5:15 pm today. Group Big Bang put on an amazing show. 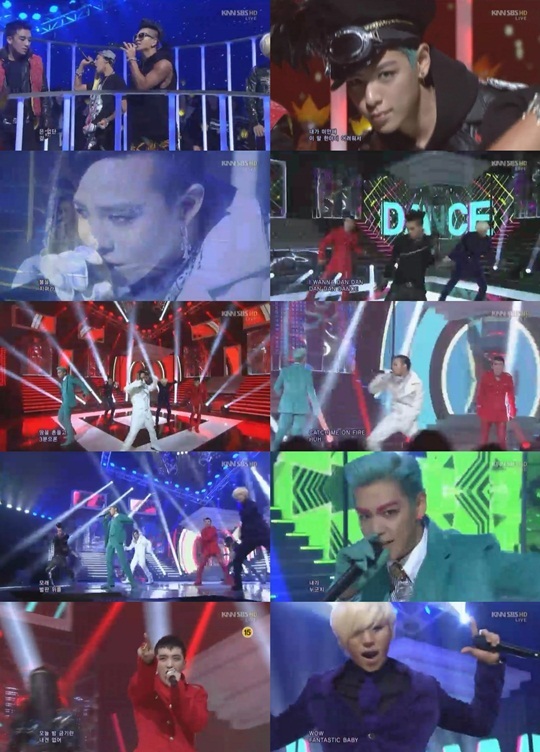 For SBS Inkigayo on the 1st, Big Bang performed "Bad Boy" and "Fantastic Baby." Big Bang first did "Fantastic Baby," where the Big Bang members were placed in the audience in a cage. TOP's feathered hat was especially eye grabbing. Then they performed "Fantastic Baby," where the members wore red, green, white, blue, and black. TOP's mint hair and pink eyebrows drew attention as well. The performance got a lot of attention for its fun and energetic beat along with the unique stage clothes. "Fantastic Baby" is the fastest and strongest song from Big Bangs 5th mini album and it had the greatest reaction from the audience at Big Bang's world tour. Other artists who performed at Inkigayo are Bohemian, C-Real, X-Cross, Tao & Haha, Nine Muses, BtoB, Spica, Ailee, Nuest, Bilasa, Lyn, K. Will, Miss A, 2AM, ShinEE, and CN Blue. Kyunghee University conducted a poll from March 26th to the 31st, asking K-Pop-related questions to a total of 524 foreign international students and foreign working professionals living in Korea. 22.1% of the foreigners from 65 different countries including the US, England, France, China, Japan, Mexico, Brazil, Uganda, and more selected Super Junior as the best celebrity to teach Korean to non-Korean speakers, and trailing behind Super Junior were TVXQ (14%), Girls’ Generation (12.5%), and Big Bang (9.6%). When asked who would serve as the best tour guides for international visitors, 37.7% of the participants selected Girls’ Generation, 20.2% selected Super Junior, 10.2% selected 2PM, and 8.6% selected Big Bang. 24.1% of the participants also credited YouTube to introducing them to the K-Pop phenomenon, while 23.3% credited television broadcasts within their own country, 17% selected Korean programs, and 10.5% said Facebook opened their eyes to K-Pop. But 58% of all participants admitted that their interest in all things Korean grew after being turned on to K-Pop. Kyunghee University will also be holding a K-Pop themed ’15th Annual International Korean Language Competition’ on May 17th. Jang Nara revealed that she is a fan of Big Bang‘s G-Dragon and T.O.P! During her interview, she also talked about how it was difficult for her to adjust, when she started her activities in China. 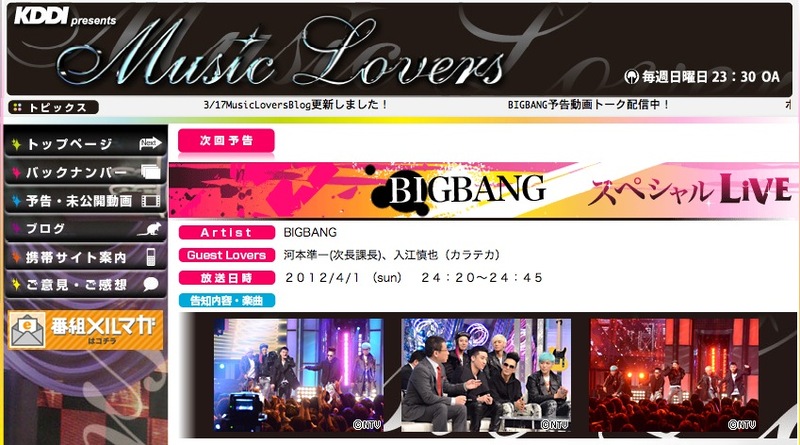 It’s been revealed that Korean group BIGBANG will be making an appearance on TV Asahi’s popular variety program, ‘Onegai! Ranking‘. 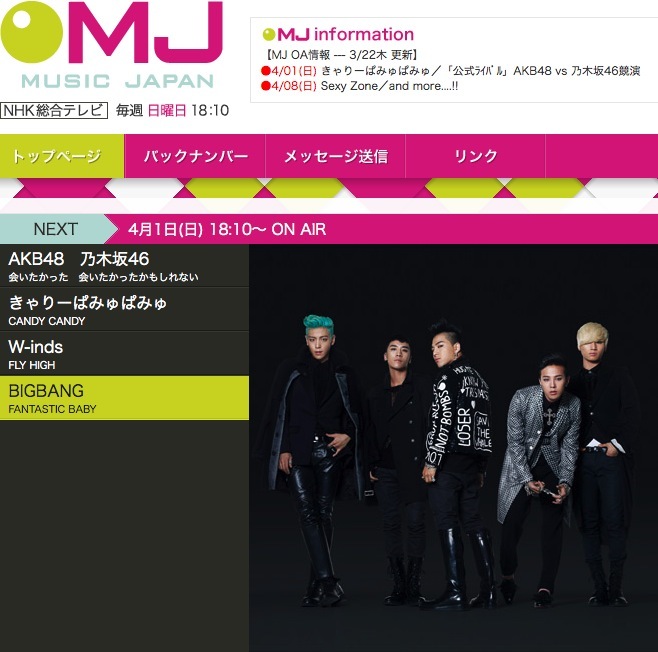 BIGBANG will be introduced by comedian Watanabe Naomi in the “Ima Hamatteiru Artist” (Artist I’m Into Right Now) segment of the program, and they will perform their new song, “FANTASTIC BABY“. Aside from Watanabe’s segment, the episode will star actress Nagasawa Masami and talento Oshima Mai, who were all born in 1987. The program’s ‘Strike Music‘ segment features 3 celebrities who were born in the same year, and they present songs they were hooked on during their childhood days. If both agree, it’s a “strike”; if only one agree, it’s a “spare”; and if no one agrees, it’s a “gutter”. After their live performance, Watanabe, Nagasawa, and Oshima all took the stage, asking BIGBANG, “Among the 3 of us, who is your type?” Surprisingly, 3 out of the 5 members chose Watanabe. ‘Onegai! 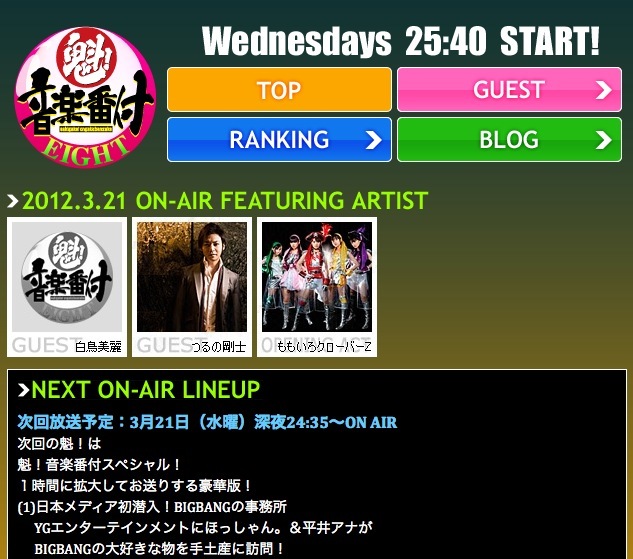 Ranking’ starring BIGBANG will air on May 3rd at 12:20 am. Big Bang will be meeting with fans in 160 countries around the world through MTV World Stage-Big Bang Alive before the start of its world tour. 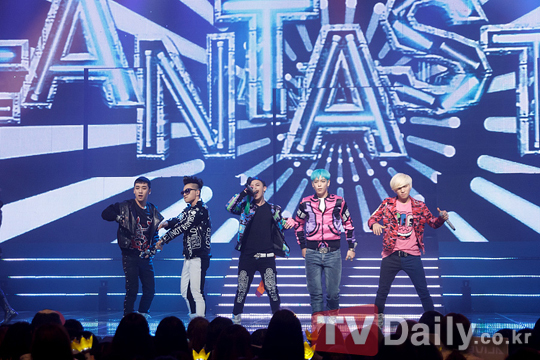 MTV World Stage-Big Bang Alive will air worldwide on May 4. Most of the broadcast will be devoted to the group’s performances of tracks from its fifth mini album Alive. 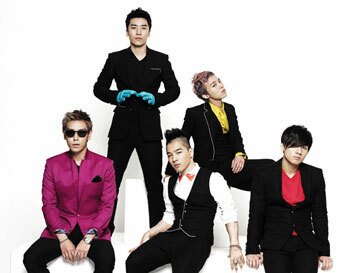 The performances of Bad Boy, Fantastic Baby and Blue from the group’s Big Bang Alive Tour 2012 held in Seoul in February will be making it into the broadcast, which is expected to effectively draw anticipation from the fans waiting for Big Bang’s world tour to come by their countries. 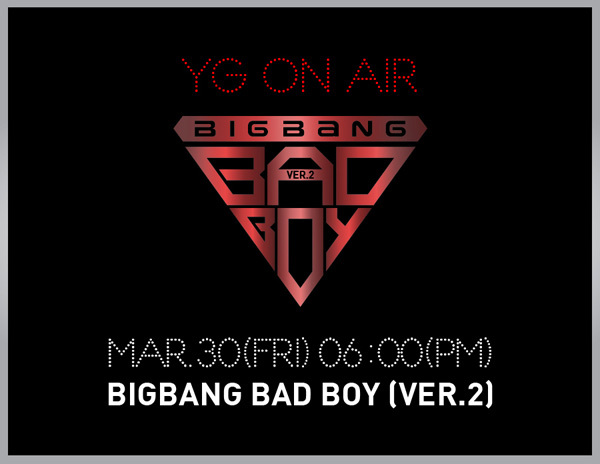 More performances from Alive and interviews of the members previously revealed through the ‘YG On Air’ service on Naver Music will air alongside the other videos. MTV World Stage is a show that airs clips from live concerts of globally renowned artists with the aim to deliver a wide variety of genres to its viewers. In 2009, it started with Coldplay, and continued to air concerts and music festivals by big stars such as Oasis, Beyonce, Lady Gaga and Black Eyed Peas. After becoming the first Asian team to win the Worldwide Act Award at the MTV Europe Awards, Big Bang managed to follow the feat up with the broadcast, standing shoulder to shoulder yet again with world class singers. 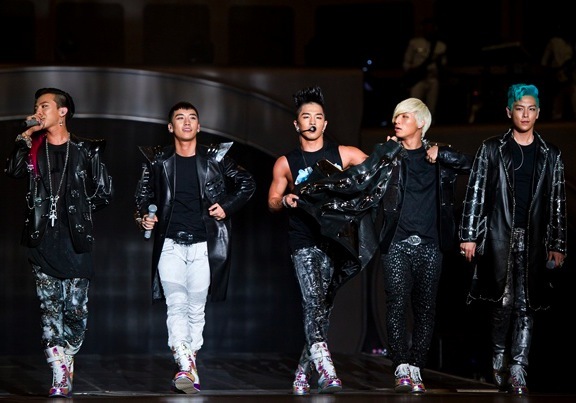 From May, Big Bang will start up its Big Bang Alive Tour 2012 in Japan with Live Nation, the entertainment company that helmed the world tours of Madonna and U2.